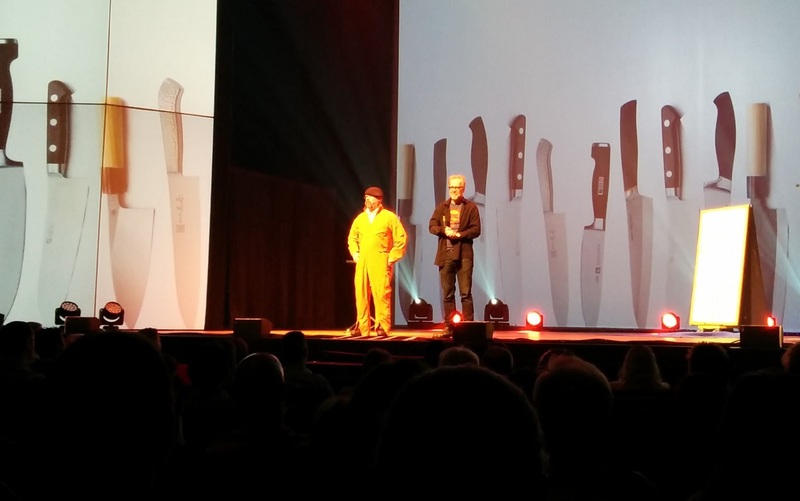 I often say that Adam Savage is my "Maker Hero." His work over on Tested and his One Day Builds are the stuff many of my dreams are made of, and no one inspires me to learn and make and just DO more than he does. His enthusiasm is infectious, he leads by example, and I like that he's one of the few celebs out there who gets cosplay - especially since I've met other "nerderati" who turn up their noses and made/make me feel somehow lesser for partaking. So yeah, that was a definite fangirl moment. Little did I know, it was about to get so much better. Less than five minutes later, I saw I had a direct message over on Twitter. FROM ADAM SAVAGE. 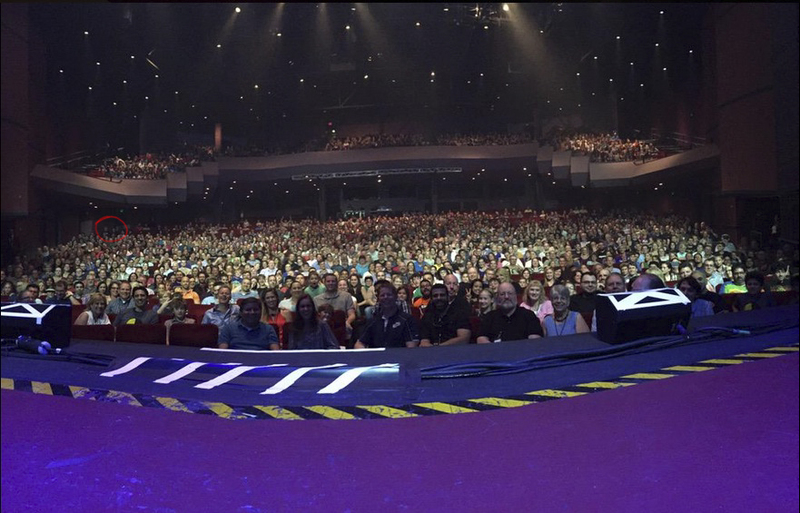 Inviting me & mine to the Mythbusters show that night here in Orlando. I'll pause here to let you imagine my reaction. Ok, now see if you can spot Jamie. The whole thing felt pretty intimate and low-key, though, almost like a convention panel. (If panels had giant paintball gun rigs.) Both Jamie and Adam seem exactly the same live as they are on camera, with the slight exception that it's clear Jamie doesn't relish speaking in front of large audiences. No big surprise there, but it may help explain why this is his "farewell tour." And really, the thought that Jamie's overcome something I struggle with myself only makes me respect him more. I especially liked how both guys went out of their way to include and encourage the young girls at the show, and Adam's mini-rant on the need for a Wonder Woman movie drew well-deserved cheers. Ah, but that's not all! After the show we were led back to a large practice room with maybe 50 other people, where we got to meet the guys and take pictures. I had to say my name twice (since my voice gave out), but as soon as Adam realized who I was he yelled "Cake Wrecks!" and gave me a big hug. Then he proceeded to tell the room at large about the site, and after a quick chat, had someone take a picture of us together with his own phone. I was pretty stunned by it all, and my friend Missy laughingly said later, "He seemed more excited to meet you than you were to meet him!" That's the trouble with being more of a "Kermit flailing on the inside" kinda girl, heh. And best of all? NO PANIC. I think these Hashimoto's meds are helping! I try to do a couple of reader meet ups a month, and usually when I meet you guys we greet each other like old friends. We hug and we laugh and we get right to the geeking out. Sometimes, though, there are tears, or a little stammering, or John will tell me later that this one was shaking from nerves, and I never noticed - because I was nervous myself. It makes me want to be better. I think inside we're all still 12-years-old sometimes, desperate for that connection and approval from someone we admire. I see it in myself with various artists and writers, and when I see it in fans, it makes me want to do everything I can to just not screw that up. Because I've met childhood icons who obviously didn't give a damn, and then I've met people like Adam Savage - and I always, ALWAYS, want to be like Adam Savage. So thanks again, Adam, for being awesome to this fangirl, and thank you guys for freaking out with me. See, I knew you'd understand. That is SO COOL! I was able to see their show when they came to Minneapolis and it was awesome. That is totally, totally awesome! Adam is a favourite of mine too - I'm so jealous you got the chance to meet him! That's awesome! Internal kermit flailing is often the best! Congrats Jen! I can personally attest to your awesomeness in person- when you recognized and loved my Perry the Platypus Disneybound, I just about flipped :-) I'm so glad that you get the same kind of experiences, and I hope I get a chance to meet you again! My sister is still working at Disney- now as a puppeteer!- so I'll definitely be visiting again soon! AWESOME!!!!!!!!! Man, I Would so love to meet you, My 7 year old niece is a huge fan of yours, and you seem like the same sort of geek that I am. She's so right. I saw this post and I immediately thought about how I'd feel meeting you. You're so exciting and talented and clever but you're the most down-to-earth person. Every time people ask me that "if you could have lunch with any famous person ever, who would you meet," I always reply, "Jen Yates." Also, I never stop being happy when good things happen to you. Yay for successes and yay for awesome new friends! JEALOUS!@!!!!! Adam and Jamie and they KNEW who you were!??!?!?!?!?!?!?! So glad you got through this with very little issues. Meeting one's heroes is a huge rush. Took my sister to see the Dali Lama, Jane Goodall and Seth Godin. But Adam and Jamie, next to Nathan Fillion, words escape me...I for one would be the blubbering idiot in the corner. Oh. My. God. Ohmygod. OH MY GOD!! The Internet is now complete. I love Adam Savage, but I love you more - all your projects are super-awesome, but many of them still seem approachable even for a complete novice like me. That image is just wonderful in a really surreal way. I'm only a little jealous (ok a lot). It's SO FRIGGIN COOL that he knows cake wrecks!! I have been binge-watching Tested free past weeks, waiting for my depression-meds to kick in, and Adam Savage just gets cooler and cooler everytime he speaks. I have this book I really think he should read (after listening to a recent Still Untitled) but I didn't want to send it, because I figured no one actually reads fanmail. But after reading this I think that if someone does it's Adam. So maybe I should give it a go. You can totally picture him saying it all, especially the last bit. And the fire extinguisher bit. SO COOL!!! Also I'm delighted to know that Adam Savage is a nice and cool person! And well done for going and enjoying the event! You're amazing! Gratuitous exclamation of glee on your behalf!! I got to see them perform in Indy and loved the show. The paintball gun was awesome. I wish I could have met them afterwards. OH. MY. GOODNESS. That is so very very cool. :) I would've been totally Kermit flailing too, but mostly on the inside. I am so glad to hear Adam is as amazing in person as he seems to be on tv. And I am so very glad to hear you made it without panic and Xanax. Very impressed. I am flying to Chicago this weekend and will be taking my half a generic Xanax before I head to the airport. Hoping I don't have a panic attack. I've yet to tackle flying again since the last book tour, so I feel ya there. Best of luck, and remember those breathing exercises! Thanks, Jen. I shared your post with my husband about what to do to help someone having a panic attack. He definitely is a grounding force for me too. Btw, if we had been able to meet up when I was in FL back in December, I would totally have been Kermit flailing inside! I can hear Adam's voice in my head yelling "cake wrecks!!". Totally hear it. Amazing! The world can be a nicer place than we give it credit for sometimes. I'm going to make a sign for my office door that says, "I'm fine. I'm just reading Epbot again." You know, for the times you make me cry. My anxiety disorder tends to be well behaved, but we have some extra-special stressors piling up on us right now. Which leads to tears, usually. I cried at the local production of "Godspell" this weekend. I cried all the way through "The Theory of Everything" last night. And this just made me cry. Happy tears, of course! So happy you had this experience. Also, if I'm ever where you are and meet you, I may cry. But there will definitely be Kermit flails on the inside...you have fans! I'm a Kermit-flailing-on-the-inside kind of girl too, so I know how you feel. 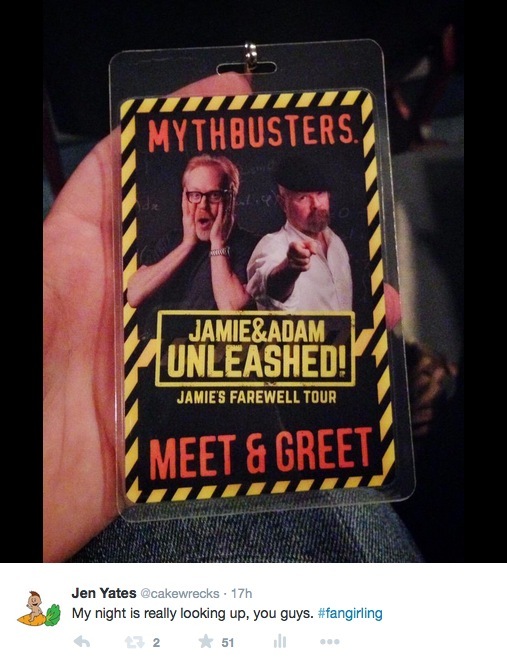 Except I don't because YOU MET ADAM SAVAGE AND HE WAS A FAN OMG THAT IS SO AMAZINGLY AWESOME!!!!!!! I'm totally jealous but so happy for you that the night ended up being so great! Kermit Flailing for you!! Yaaaaaaaaaaaaaaaay! Congrats on meeting one of your heros Jen! You are awesome! And, okay, I'm not a weirdo stalker or anything, but I don't get to read this blog very often even though I read CakeWrecks almost daily, (I've gotta get SOME work done, after all) so I'd never seen a picture of you before. You are just as cute as a button! I think it would indeed be an honor (and a lot of fun!) to meet you some day. So, so cool! What an awesome adventure! This is so cool! Happy for you Jen. Any chance you'll be at SWWE on the 23rd? There's a remote chance, since we've had some friends offer to get us in for the Weekends this year. (I've let our APs lapse 'til this Fall, since we've been hanging at Universal so much.) So... maybe? I'll try to give some notice here on the blog when/if we do go. I will admit to be a Kermit-flailing-on-the-outside type. So I'm glad you met Adam as opposed to me. There would have been a much higher level of post-meet embarrassment. You don't possibly mean contemporary Christian artist Carman, do you? Or is there another Carman I'm unaware of? Awesome. I was such a huge Carman fan. Still am of his 80s/90s albums. R.I.O.T. will always be my favorite. So totally not an embarrassing thing to admit. I even pledged to his Kickstarter back in 2013. I totally love Carman. I used to daydream about him rescuing me from my dishwasher job when I was 15. Still a huge fan at 42. I went to a Christian university, and worked at the student-run radio station. We had a "life-sized" cutout of Carman that would...move. Open the door of a darkened studio and turn the light on? CARMAN! Two steps inside the room. Ah, the pranks pulled at a Christian college. CARMAN!!! I always knew you were totally awesome!!! :D That you admitted that makes you even MORE awesome! Carman was my first ever concert! I think you're just so great. Keep up the wonderful blog. It's always a highlight of my day!! That is amazing!! I too am a Kermit-flail-on-the-inside gal, and I KNOW I'd be filled with anxiety about celeb meeting! I've done it once with my BFF by my side, and it was pretty great, so I'd definitely be willing to try again! Jen, this is the first time I've seen a pic of you, so I googled "Jen cakewrecks" and you are so beloved that there are boatloads of YOU out there in cybeville! I'm so happy you're being spoiled by people who 'get' how awesomesauce you are. Thanks for setting aside a struggle that many of us can relate to & keep us entertained. <3 You're loved, Girlfriend. Ohh, thank you for not linking any of those pics, ha! I'm not very comfortable in front of the camera, which is why it was a few years before I posted any public pics of myself at all - and then only here on Epbot. And forget that some of us don't proofread. Gahhhh! Jen, I can attest to the FACT that you are as awesome in person as you are on the internet. I was SO nervous the first time I met you and John, but after just a few seconds, we were geeking out together and all nerves were forgotten. I am SO excited that you got to meet Adam and Jamie! How amazing! And I'm glad that meeting them lived up to your expectations. Aw, thanks, Meg! You and Dave are awesome; lookin' forward to our next double date. Oh my goodness, I'd be fan girl screaming right with you!! We got to see that show in San Jose when they were out here in December. 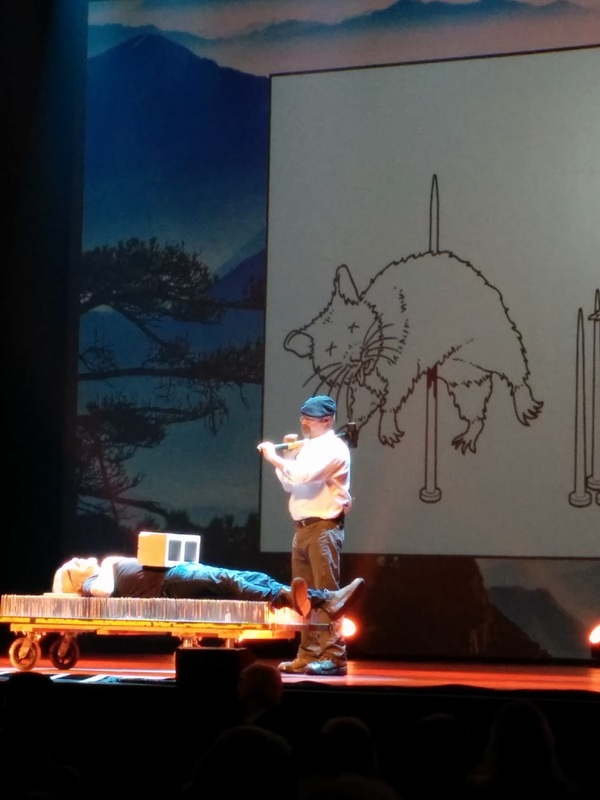 Our 7 yr old son is a HUGE Mythbusters fan (he says he wants to be like Grant Imahara someday - an inventor scientist detective guy), so we gave him tickets for his birthday. We loved the paintball armor, too, but my boy is still talking about Jamie breaking the toilet just by kicking it with his crazy boots (did they do that on your show, too?). We love that they film out here in the Bay Area, and every so often we drive past a location that they've used on one of their shows, and my son will go crazy! I think if we ever got to meet them in person, we'd be speechless, too. Shoot me an e-mail; we'll make a date! Oh my gosh, that is so awesome! 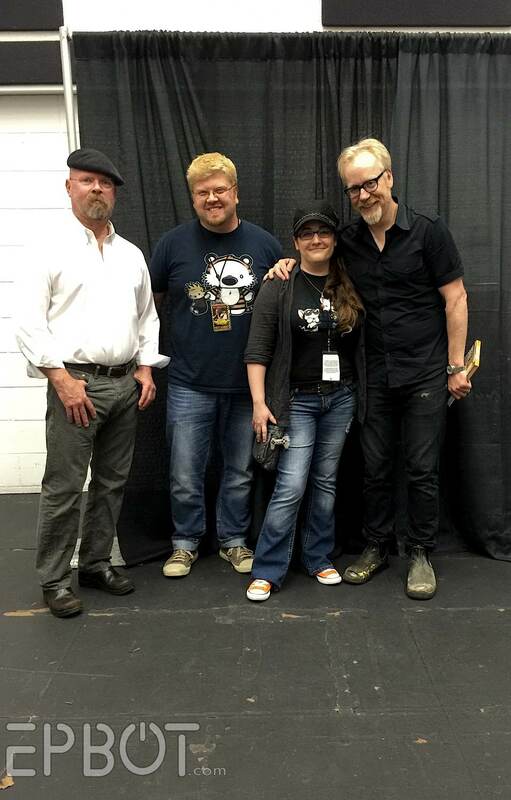 Congratulations on meeting Adam Savage (and getting through it all Xanax-free!). Oh, that's so awesome! (My husband feels the same way, btw) Kermit-flail, totally. I'm so happy that both of them were so fantastic (which isn't really a surprise), and that you felt okay. Anxiety is such a little gnawing monster sometimes, so any victory, no matter the size, is a victory. THAT IS SO COOL!!!!!!!!!! So excited to hear that you had a win - several in fact! It couldn't have happened to a nicer gal. I'd be totally fangirling if I ever got the chance to meet y'all! That sounds like a wonderful evening and I'm so happy you got to meet them. We loved seeing their show a couple of years ago. I'm simultaneously jealous and sooooo sooooo SOOOOO glad you got to meet Adam Savage. I swear it's not only because that means you'll keep on making amazing things and posting pictures/how-tos on here for me to drool over. He just seems like a great guy to hang out with. That is so awesome. I'm grinning like an idiot for you now. lol i was a terrified 12 year old getting an autograph from Carmen too! aaaaaaaaaaaaaaah! kermit flails forever! you met adam! and he's a fan! that is soooooooooo awesome!!!!!!!!!!! aaaaaaaaaaaaaahhhhhhhhhhhhh! I live in Australia, and since I struggle with travel anxiety (& a mortgage, ha!) I'm not sure I'll ever make it to Disney World. I do still travel a little, with the help of cbt & valium, but big trips are tricky for other reasons (pain etc from my chronic pain conditions) BUT if I ever do make it back to the States, I'd so love to go to Dapper Day at Disney World, check out the Harry Potter stuff there, and fangirl out meeting you & John. Happy tears!!! What an awesome story!! Oh man that's so cool. I had my own squee moment on Sunday at C2E2, our first comic con. I made a Foxy the Pirate Fox head for my 14 year old son. Near the end of the day someone put his hand on my son's shoulder to ask about his head. It was Neville Page from Face Off! He liked my work! Squeeeeeee! What a cool experience! I'm loving the Calvin and Hobbes t-shirt btw. Jenn, I can't tell you how happy I am to hear that your Hashimoto's meds are helping. I don't have Hashimoto's, but I have a completely non-functioning thyroid and taking meds literally changed my life, as I haven't had a full blown panic attack since. I am also thrilled that you met your internet hero (or one of them). I squee for you! Cheers! Absolutely, fantastically wonderful!!! I'm so glad that you got to meet some of your heroes! Adam and Jamie are two of my favorites, I feel like they would just be a blast to meet (and apparently they are!). I can totally understand your Kermit flailing!! I also have to say that in the many years that I have been following this blog it has really helped me take a closer look at my own anxiety issues. My only real regret is that when you came up to Toronto for your book signing tour I chickened out and didn't go. You were literally about 10 minutes from my apartment but I just couldn't bring myself to go. I made it to the front door and then the "what if's" started. But I promise, one day I will make it down there for a visit and we can go get that Dole Whip at Disney! I am so happy for you and hope you know how much hope you give. I completely get it- I have to admit, the day we met you and John, I nearly bottled it as I was so nervous and was convinced I was going to have a panic attack. But we had so much fun with you! Definitely a highlight of our trip! Also, I still listen to Carman on occasion, so no shame in that particular admission (in fact, I may be a tad jealous since I never got to see him in concert). 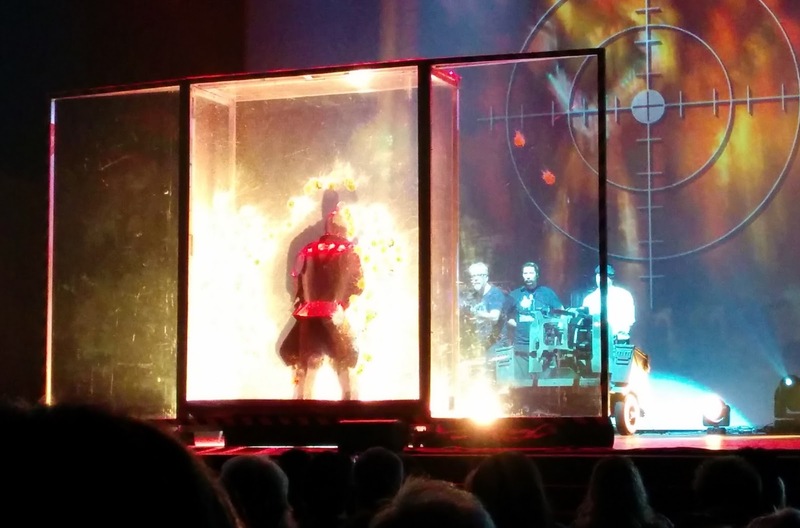 We saw the Mythbusters show when it was here last year. It was great. Adam and Jamie are both so cool. My celebrity crushes are Alton Brown (saw his show too early last year) and Weird Al (seen him in concert many, many times). I've never had the stress of a meet and greet. So happy for you! Hi Jen. I just wanted to say thank you. My 19-year-old beautiful, brilliant daughter struggles with anxiety, fear of crowds, self-esteem issues, and some mild depression at times. We have also dealt with some mild cutting issues early in high school. She is getting much better at managing everything, and has really thrived since she went off to college. I want to thank you for two things: one, the way you have shared the things you struggle with, and the things that help you, have helped me better understand how to do the right things for her. You helped me realize that some of my first instincts on what to do were the exact wrong thing for someone with her struggles. Also, the simple fact that you are willing to share these things about yourself (and I know how hard that is), helps to bring better understanding to these issues, and help to remove some of the stigma too many people associate with it. So, thank you, for being you. My gosh I did not think it would be possible to capture an actual photo of someone doing a Kermit flail on the inside ...... but there it is. You can totally see it. Love that grin on John, too. Woot! How AWESOME!!!!!!!! Thanks for sharing that, Jen. I'm so pleased for you Jen! I started kermit-flailing myself at your photo with them out of sheer empathy for how excited I suspect you were . And that's surely what this sort of community is all about? Vicarious excitement and geeky fulfilment through each other? I also solemnly promise that if I ever meet you, I'll kermit flail on the outside as well as the in. Congrats! You deserve it. You are such an inspiration to us and to nerds and geeks in general. You're definitely worth it. Thanks for all the smiles and for helping folks feel better about themselves. I'm grateful to see that your kindness is bringing you good things. Thanks for the smiles and for being 20% cooler. 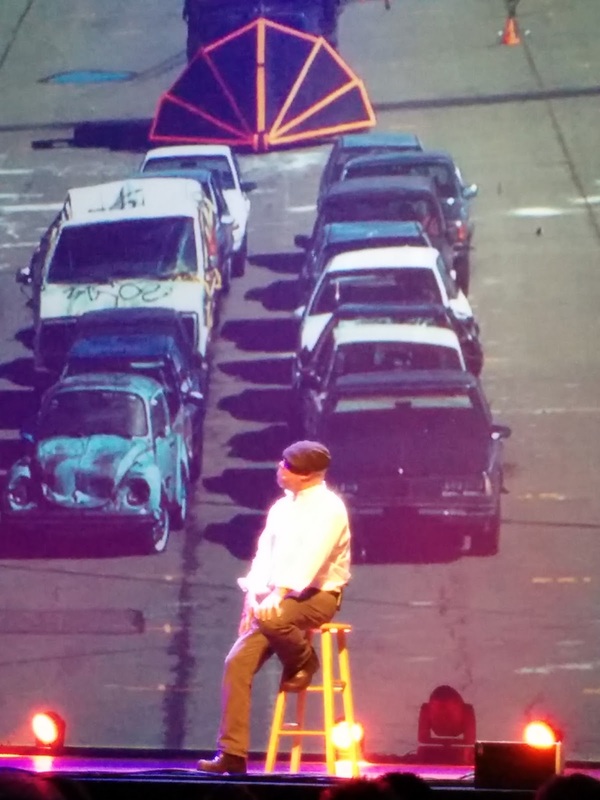 I went with my family to the Mythbuster's show when it came to our town a couple weeks back. Super fun! Jamie is definitely not into extemporaneous talking. They seems like genuinely cool, friendly people, and it was such a blast! I especially appreciated the focus on getting the young women and girls in the audience to participate - it makes me so happy to see someone use the enormous platform they have for so much good. Felicia Day is a good person to be mixed with. I ran into her once in a bathroom during San Diego Comic Con, and while the convo was very short I was definitely Kermit flailing on the inside. She was SO nice!! I came out super excited and my husband goes "she probably thought you were stalking her in the bathroom" and then I felt so awkward. But Felicia never made me feel weird (and I wasn't stalking her, it was just a lucky coincidence). That kermit graphic is perfect. That's exactly how I would feel if I got to meet somebody I looked up to. On the outside, I would be visibly nervous, but on the inside I would be FREAKING OUT!!!! AH! This is so cool! Love that you're wearing your orange Chucks as well the tees you and Jon are wearing. Yayyyyyy! I got to see them at the Tampa show. so much fun. Super stoked for you and John! And Adam, of course, because he got to meet you both! Does Adam Savage know about this blog? I think he might like your build projects. I can totally picture him sitting on an adult sized At-At Rocker. So cool! Adam Savage is one of my personal heroes because smart, funny guys never get to be the cool guys, but he and Jamie DID! I've watched every episode of Mythbusters and I love Adam's web stuff. I'm jealous that you got to meet them, but who better than you. Thanks for letting us live vicariously through you! Yeah!!!!! Love Mythbusters, when I had control of my own remote I used to watch every episode. I had no idea they had live shows. And I only hear about it when it's Jamie's farewell tour :( Dang! But I'm glad you guys got to go! JENNN!!! This is by far one of my most favorite pictures on the internet. I hope that you realize, as Adam has proven, that you and John have already long ago risen to the same status in people's hearts as they have in yours.